At the Recovery Mode of the wizard, choose the necessary restore mode. Select Restore to the original location if you want to restore the VM with its initial settings and to its original location. If this option is selected, you will pass directly to the Reason step of the wizard. Select Restore to a new location, or with different settings if you want to restore the VM to a different location and/or with different settings (such as VM location, network settings, format of restored virtual disks and so on). 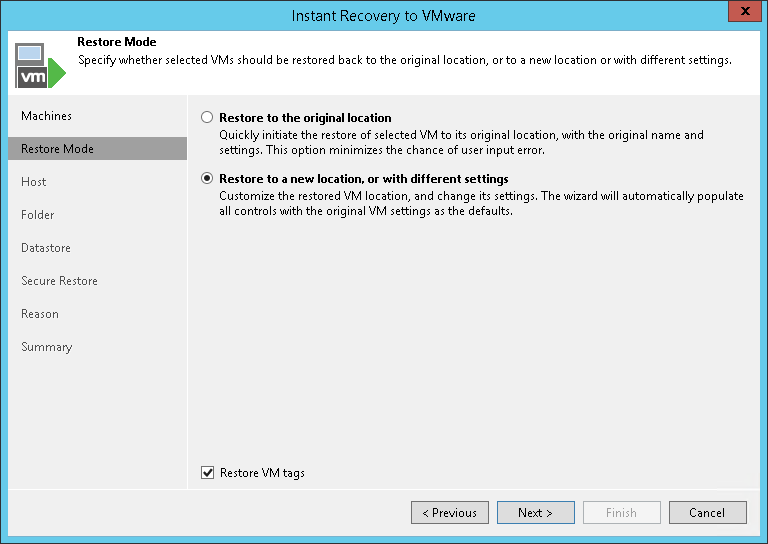 If this option is selected, the Instant Recovery wizard will include additional steps for customizing VM settings. The VM is restored to its original location. The original VM tag is still available on the source vCenter Server. If you recover a VM with original settings, and the original VM still exists in the virtual infrastructure, the original VM will be removed.